Press the Super key to enter the Activities Overview, type Users and then press Enter. The Users settings tool appears. The Super key appears in a variety of guises, depending on the keyboard and other hardware, but often as either the Windows or Command key, and typically to the left of the Space bar. Alternatively, you can open the Users utility from the Settings menu after clicking your user name in the top right corner of the screen. To make changes to the user accounts, first select the Unlock button and authenticate yourself as indicated by the dialog box that appears. Note that unless you have superuser privileges, the application will prompt you to authenticate as root. To add and remove users, select the + and - button respectively. 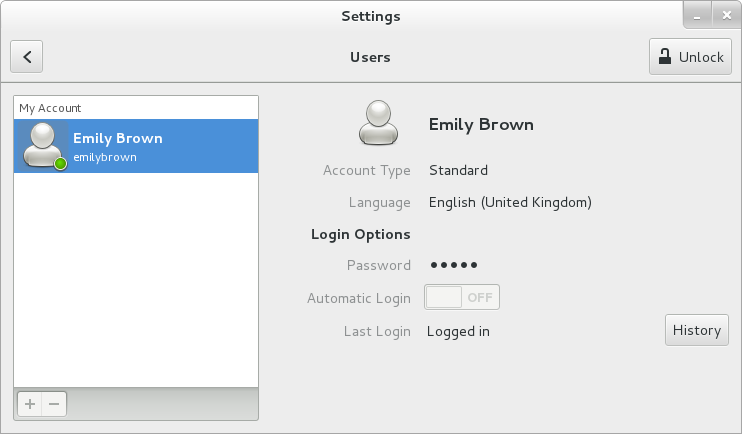 To add a user to the administrative group wheel, change the Account Type from Standard to Administrator. To edit a user's language setting, select the language and a drop-down menu appears. When a new user is created, the account is disabled until a password is set. 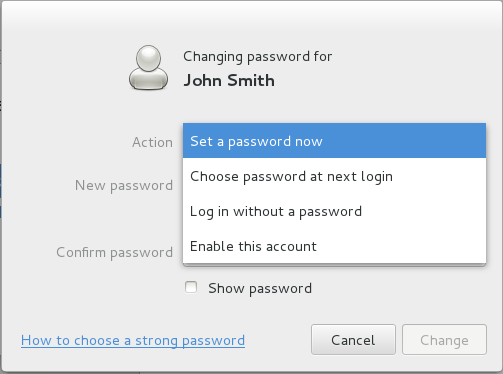 The Password drop-down menu, shown in Figure 4.2, “The Password Menu”, contains the options to set a password by the administrator immediately, choose a password by the user at the first login, or create a guest account with no password required to log in. You can also disable or enable an account from this menu.